Continuing our journey through what I like to call “Birthday Season,” we have Meg’s birthday! Every year is a challenge to come up with something different and fun, and I’m pleased with the result of this year’s cake. 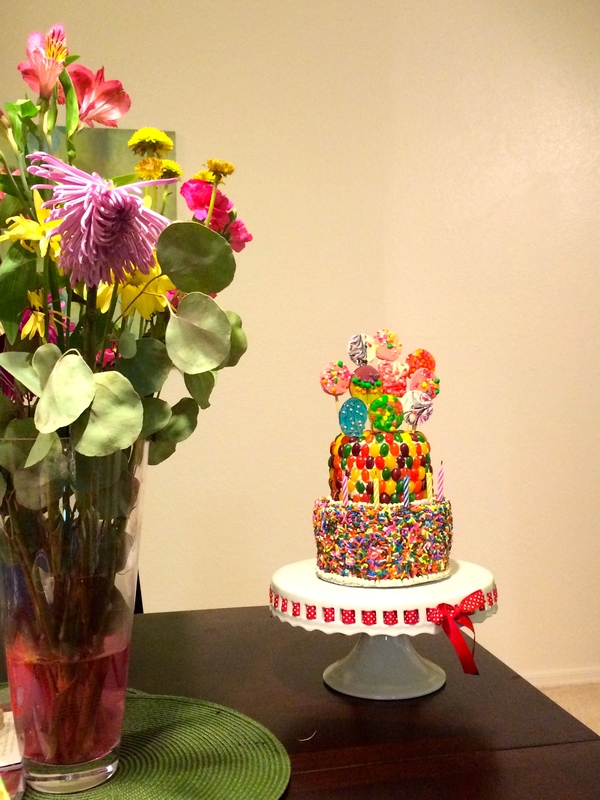 Lauren and I decided to play on her love of candy and sprinkles and all things sugary. 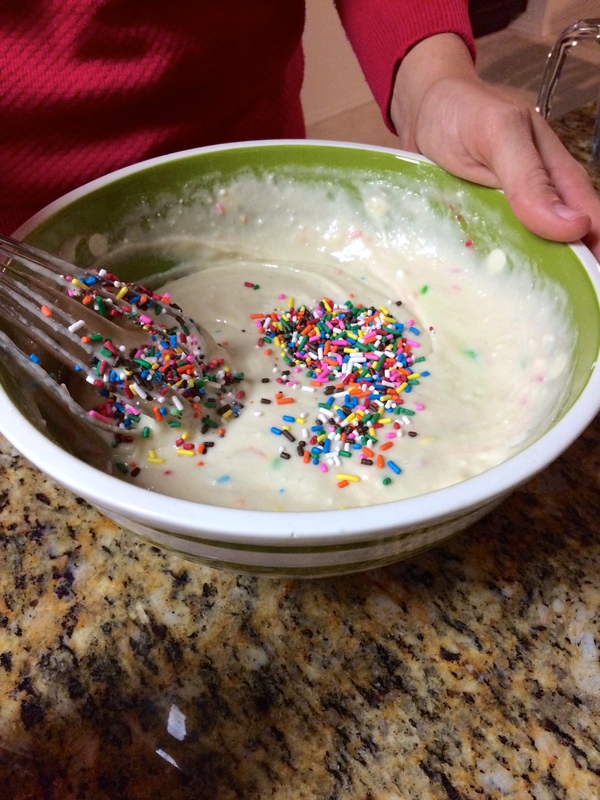 We started with a base of homemade funfetti- basically a white cake with tons of sprinkles tossed in. A 6 in. tier with two layers, ready for vanilla buttercream filling. 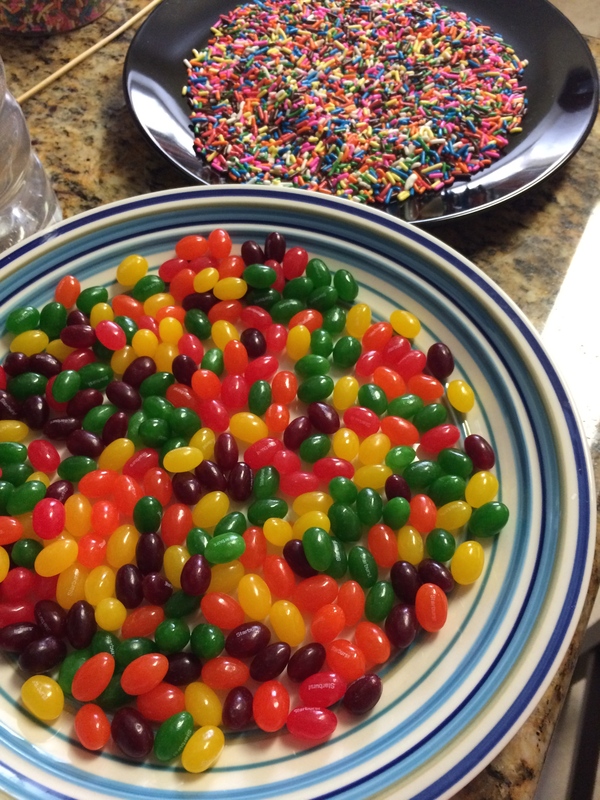 Sprinkles and Meg’s favorite jellybean- the Starburst jellybeans. Yup, we did- or actually, Lauren did- we took the frosted 6 in. 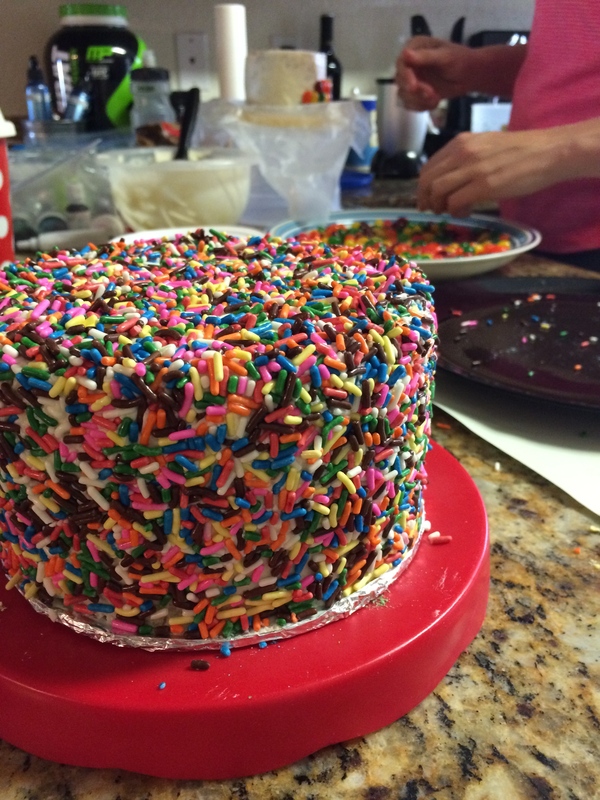 tier and rolled it in sprinkles! This vision came together piece by piece. We had an idea for the two tiers, but wanted something fun for the top. I had been wanting to experiment with decorated slabs of chocolate, and thought this was the perfect topper for this project. 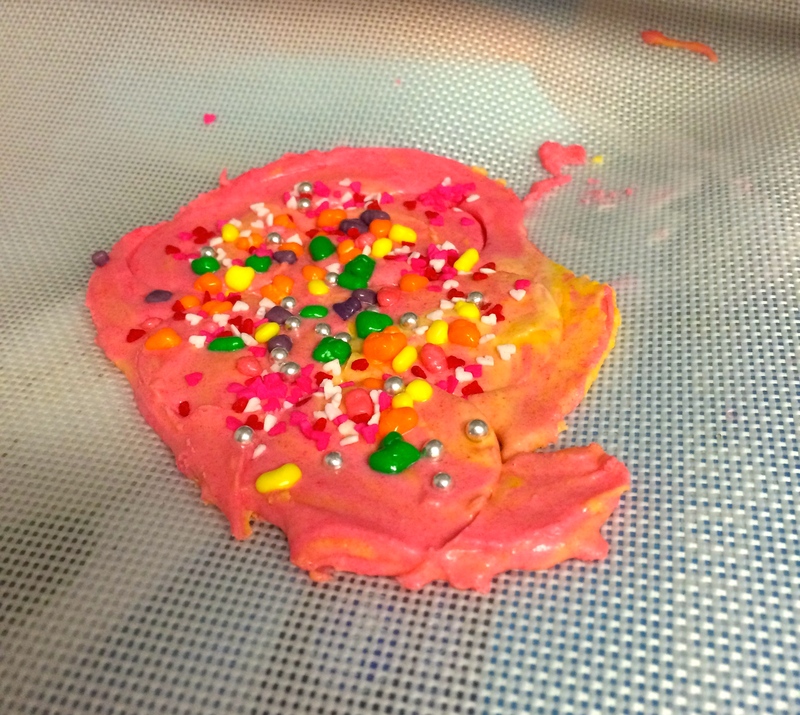 Above is a photo of melted white chocolate with some food coloring mixed in, topped with pink and red heart sprinkles and pink edible glitter. Once the chocolate dried, I used cookie cutters to cut a heart and circle out of the chocolate. 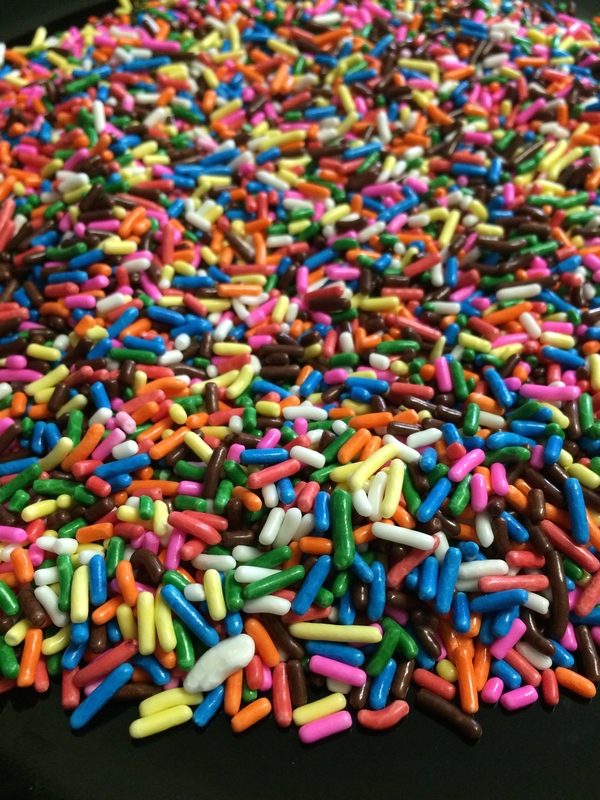 Another experiment: pink and yellow tinted white chocolate mixed together, topped with nerds, sprinkles, and edible silver dragees. A note for anyone who tries this- I believe I spread this mixture on a silicone mat so that it didn’t stick. Parchment paper also works well. 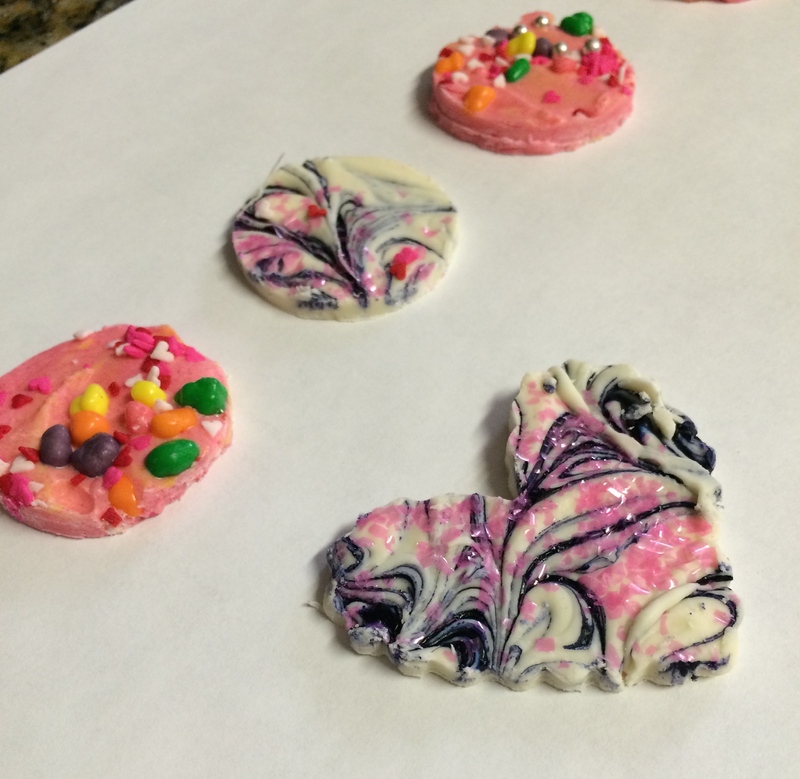 The resulting white chocolate cut outs were pretty! Some were a little fragile but the good thing about chocolate is that you can glue it back together with a little more melted chocolate 🙂 You’re probably wondering how we attached these to the cake top. We made them into lollipops! 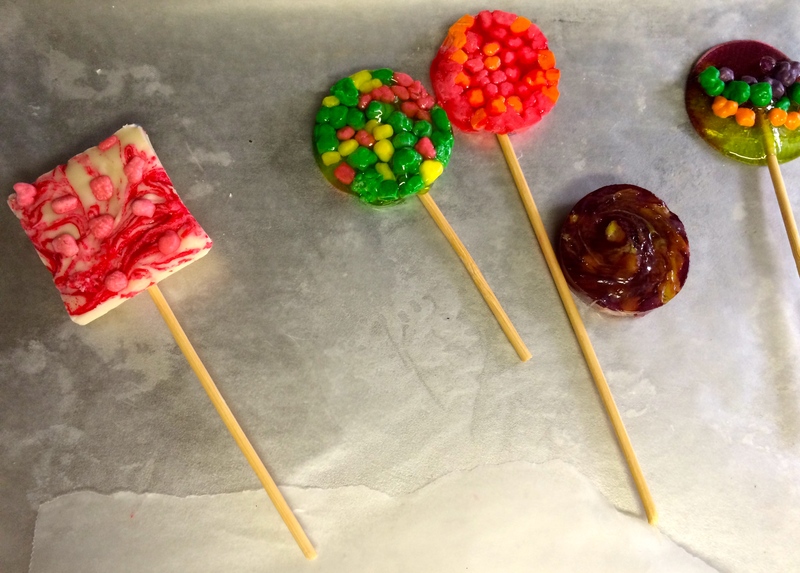 (of sorts) I’ll add that Lauren turned into a candy-maker and made some actual lollipops using a similar technique to the white chocolate, but melted jolly ranchers instead and threw in all the fun toppings. The finished cake- a toothache waiting to happen! 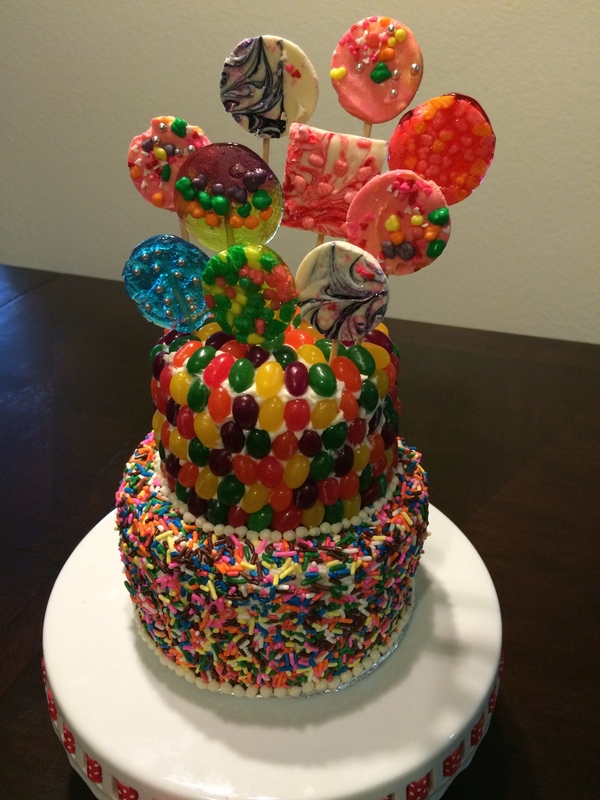 The smaller tier was a 4 inch funfetti cake, filled with vanilla buttercream, and covered in careful arranged Starburst jellybeans. Lauren did the legwork there. We managed to arrange all of the lollipops on top in varying heights for some visual interest. 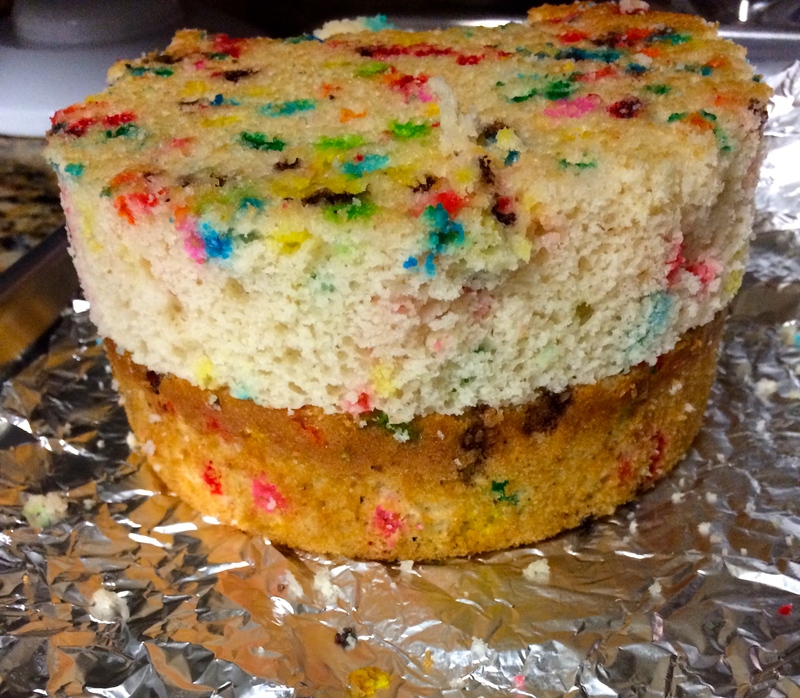 I piped a small border of buttercream dots between the layers and at the bottom of the 6 inch tier. It was a small cake, but sometimes I think “personal” size is more fun. If you look closely, you can see the candles, but it’s hard to tell with all of those colors! 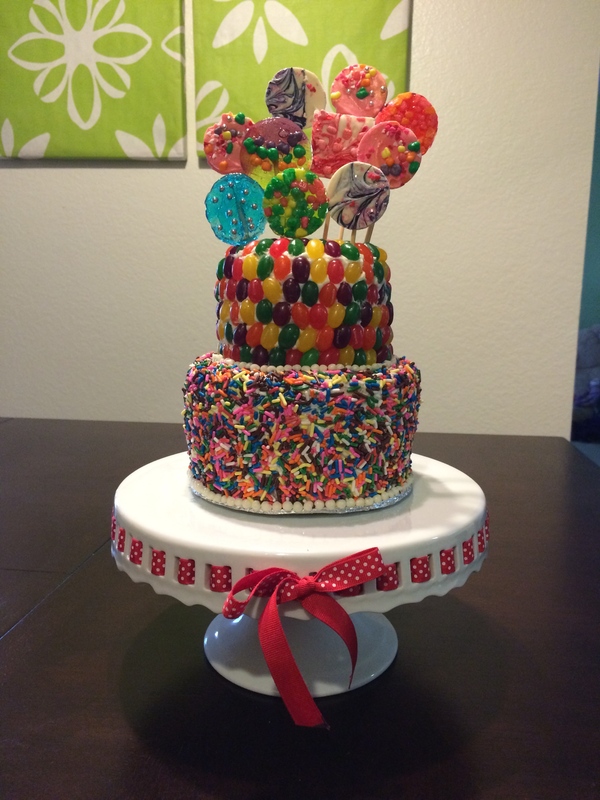 It was probably the sweetest cake I’ve ever made- no pun intended- it smelled like sugar! Happy Birthday Meg!! In a Nut(ella)Shell, Happy Birthday!